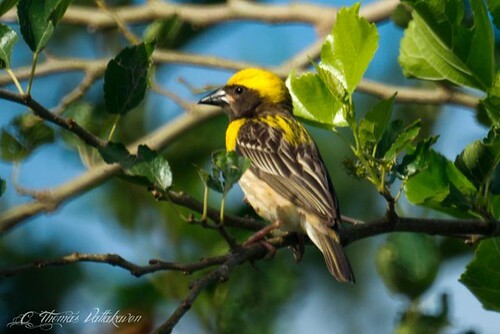 The Baya Weaver bird (Ploceus philippinus) is a sparrow sized bird known best for its long hanging woven nests. In spite of the nests being well know, its occupants are rarely recognised. In the non-breeding plumage, the male and female resemble the common house sparrow. In breeding season though, the male is completely transformed. 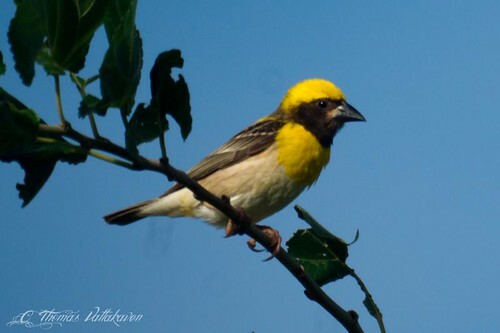 It acquires a bright yellow cap and a blackish brown face-mask. The bill is also transformed from a horny colour to black. 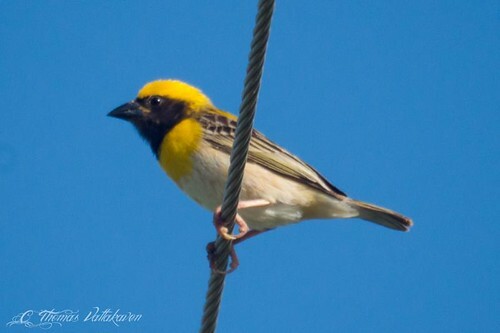 The breast becomes yellow and the rest of the upper plumage is blackish brown, streaked with white and yellow on the upper parts. The under parts are a creamish buff colour. The bill is heavy and conical. 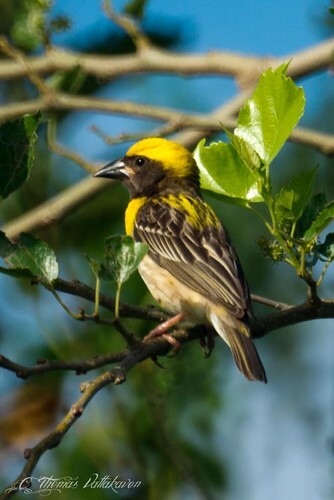 The females in breeding season are still dull in their plumage (below). These are social birds and are often noticed after the nest is spotted. 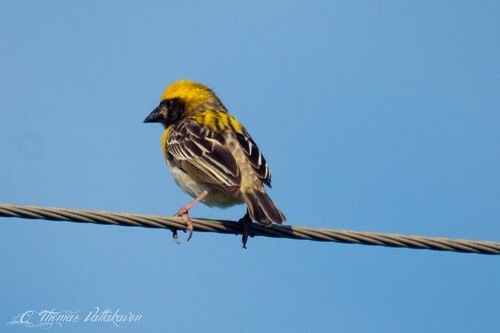 When not breeding they are easily dismissed as sparrows. They occur in open grasslands and open cultivations. 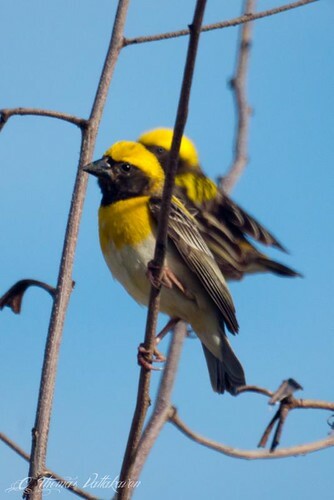 They feed on seeds of different kinds and are known to damage seed crops. However, it also feeds on pests such as caterpillars and locusts. They are also known to catch small frogs and molluscs, especially when feeding their young. 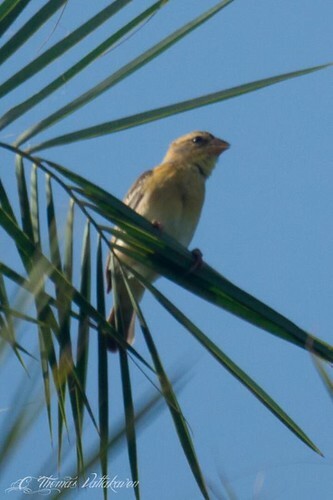 This bird breeds during the monsoons, in colonies of 20-30, close to sources of water, food and nesting material. 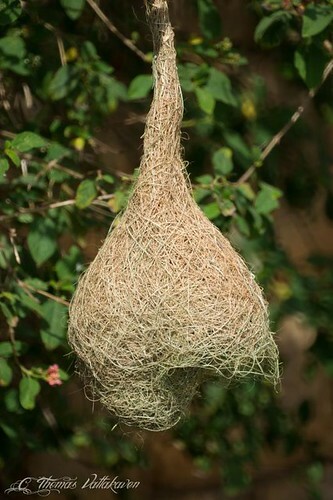 The nest is a long graceful retort-shaped made of woven grass, with the mouth pointing downwards, suspended from the outer boughs of trees or bushes, often built over open water. It is the males which build their nests, stripping long grass and paddy, and weaving them into place between numerous trips. The strips are green when new and recent structures can be recognized by the greenery. Once the nests are built, the females arrive and chooses a male whose nest she likes, and occupies the nest, while the male only then completes the entrance to the nest. (you can see in the above pictures that the entrance has not been built yet). Many partial nests may also be built. As soon as the nest is complete, the female lays 2-4 eggs. The male then starts to build another nest to attract another female! If all goes well he repeats the attempt a third time too. However, females are polygamous too. 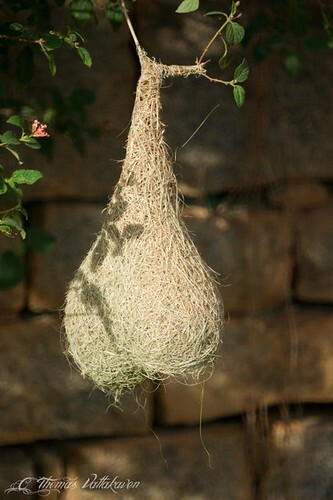 Nests are known to be destroyed by crows or lizards and may also be taken over by the Indian Silverbills. 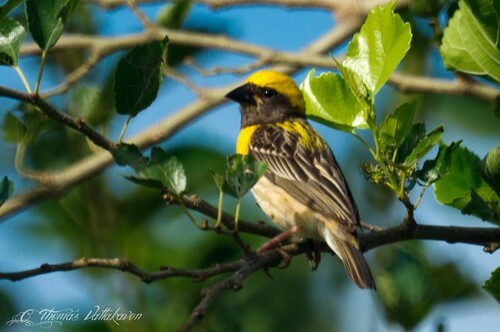 Other Details: The males had a colony of nests inside an old dried up well, built on a lantana bush growing on the side wall. Nests were yet to be occupied by females.